As you know, I’m a “Priceline sister”…… A huge regular shopper at the Australian wide pharmacy and makeup store. I had this product that I bought from there a little while ago but had not used it. 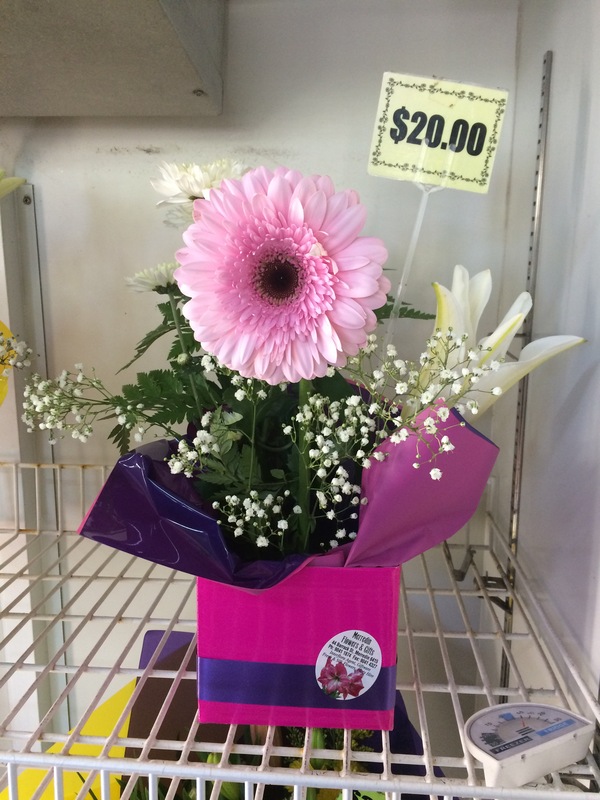 At the moment I am currently working casually at the local florist, Merredin Flowers and Gifts store. It is literally a 1-2 minute walk from my home and I just made my first set of flowers. I like the fact that I can use my creative side of my personality. I always wanted to have a job where I use LOTS of creativity as its a BIG thing for me!!!!! Here is a photo of what I did!!!!! I am sssooooo excited to use my creative mind in something and I absolutely love the Body Shop collection of soaps, hand creams and powders. They have orange blossom hand creams and talcum powder. Since starting, I have not found myself to be used to working as it has been since March last year that I have not been working. I am not used to being on my feet all day! 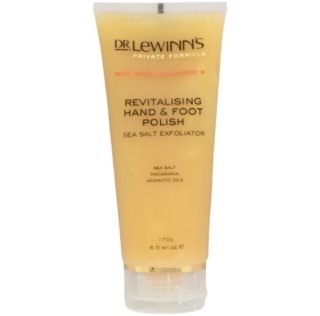 Which is why, when I got home, the Priceline product that I was talking about is Dr. Lewinn’s Revitalising Hand and Foot Polish. Sadly, it seems to be discontinued by Dr. Lewinn’s themselves (yes I did my research!) but there might be a possibility that you can find it at Priceline. The best part about it is it is an exfoliator and it is also Sea Salt. It also has macadamia and aromatic oils. It makes you feel like you’ve been to a day spa without the expensive entry! After rubbing it on my feet I just felt sooooo much better!!!!!! My feet don’t feel as sore anymore, and it felt heavenly when massaging my feet! It is a great formula and is highly effective to exfoliate and moisturise to soften, smooth and revitalise the hands and feet! 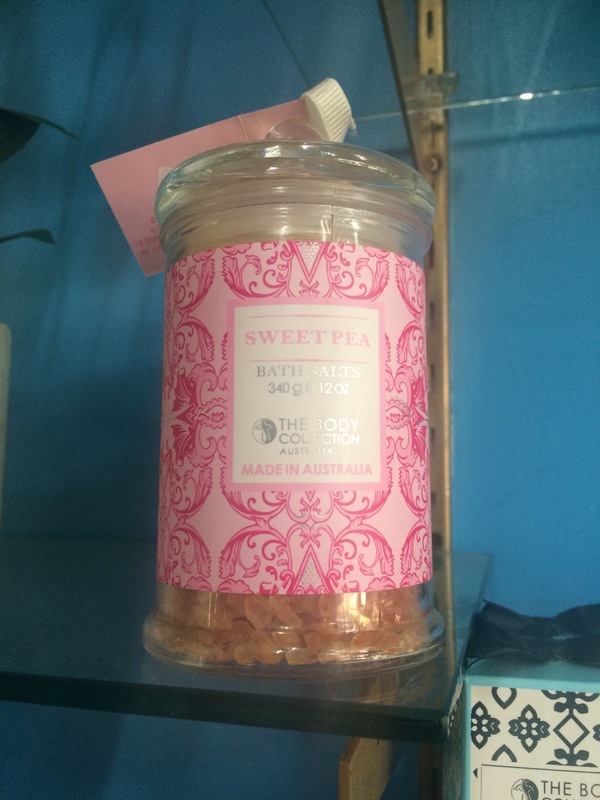 So because of working at a giftware place, The next product on my “to buy” list is a Sweet Pea Bath Salt and is ONLY $13.95!!!! How cheap!!!!! I am grabbing it as soon as I get my next pay!!!!! Hehehe I tried looking for it on the internet but I think you might have to go to the main website. Hop on over to the The Body Collections Facebook page!!!! 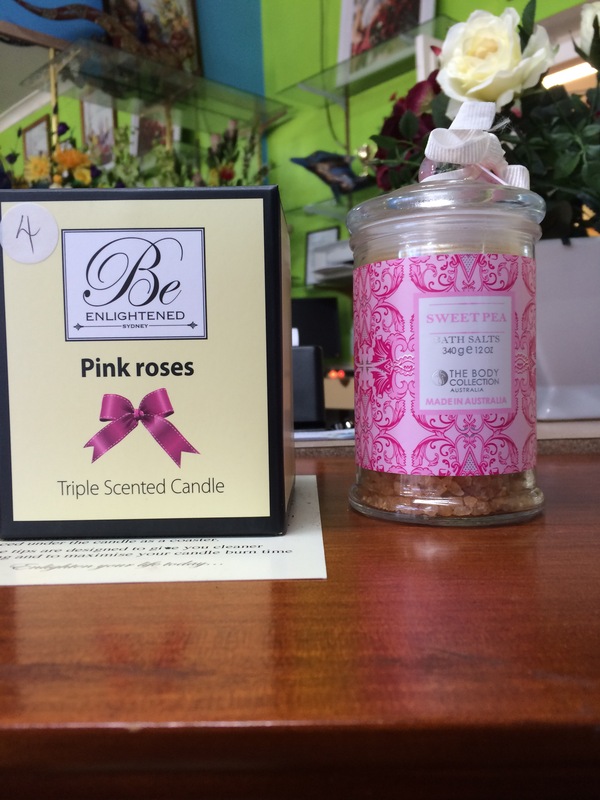 You can have the candles going while popping in the bath salts in the bath and experience a bit of aromatherapy! I may book a haircut appointment as I like to keep my hair at shoulder length, with a concave look. If I do do it, I will post a photo when I’m done! Today I had such an awesome day! I have never had such a productive Sunday in all my life!!!! I attended TWO workshops in Merredin at the Community Resource Centre. 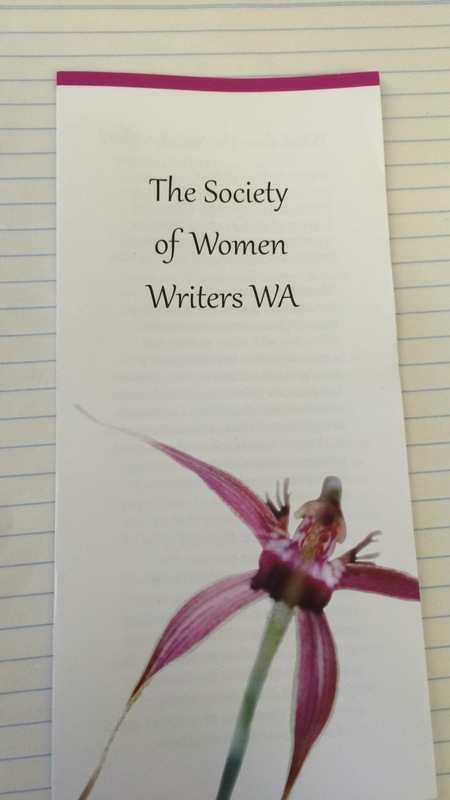 It cost $40 per workshop and it was with The Society of Women Writers WA. My granny was a member so it has been a desire to join as well, like I have said, she has played a BIG role in my life and I believe there is a story that she left behind. I need to read her book! She’s left a Legacy for me. 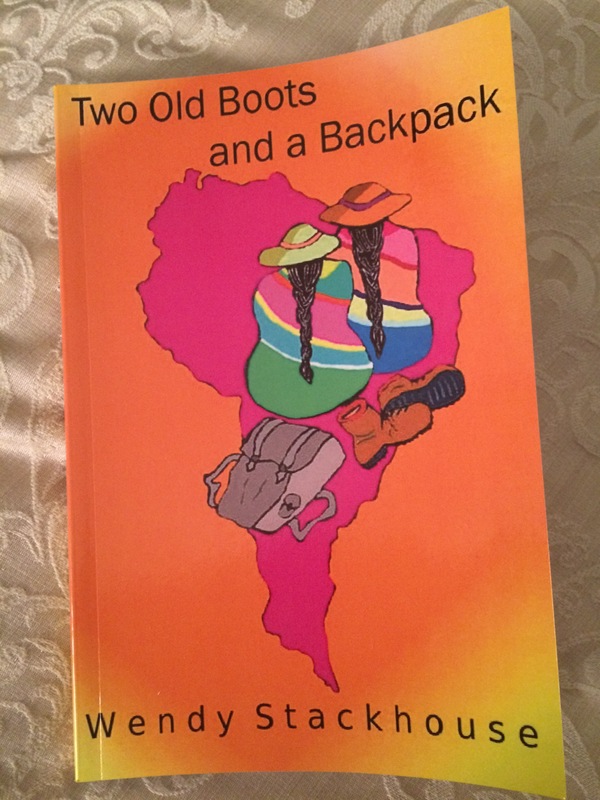 I met Maria Bonar who is the Vice President and Wendy Stackhouse who wrote a book called “Two Old Boots and a Backpack“! We had a conversation about Rio and a bit about her travels. 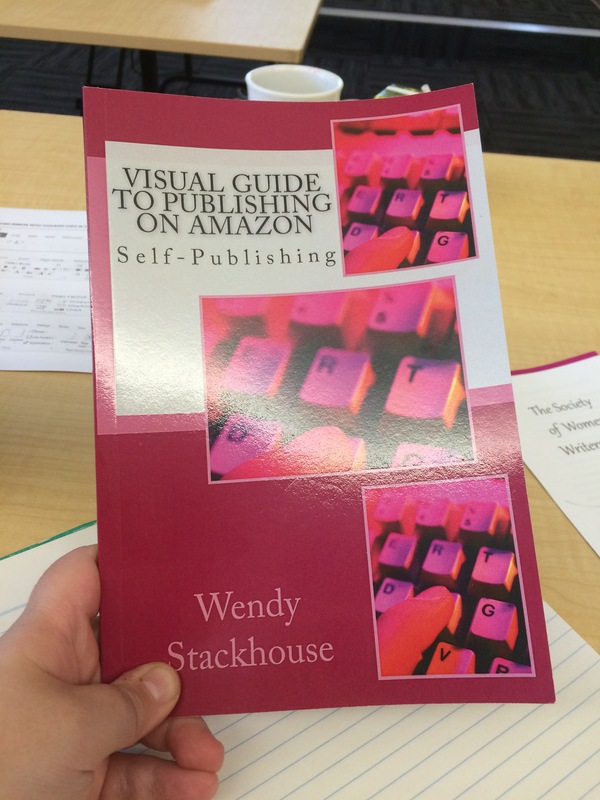 Wendy hosted the workshop, Self Publish to Amazon and Creating Book Covers which went from 1pm to 4pm. She wrote the course in a book called “Visual Guide to Publishing on Amazon – Self Publishing” which I only bought for $10. On Amazon it is $8.96 and you can download it onto Kindle, your laptop or iPhone! It has many helpful tips within the publishing arena and the idea of creating a book cover and designing it sounds like my kind of fun!!!!! She helped me a lot with the idea of creating a novel which I have mentioned previously, but I haven’t felt as confident about writing a book because I go through stages where I don’t think I’m quite educated and don’t know big words! I only went to Footscray City Secondary College from Year 8 to 12! But I know I shouldn’t talk down on myself because who knows! I’ve always believed everyone is talented. It’s like singing, you may think you don’t have the voice but if you go to lessons and keep on practicing you can fine tune yourself. 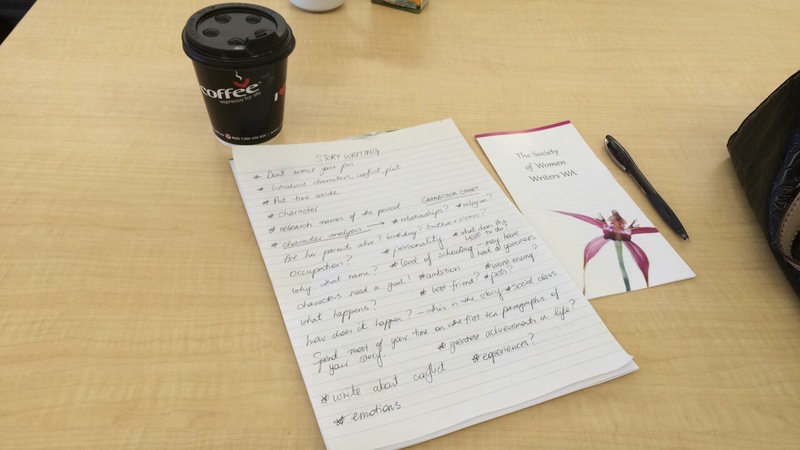 Back to basics, the storytelling workshop honed in on character analysis and we talked about my idea for a novel. Things you have to ask yourself are, is the main character religious? What’s the personality like? What does she love to do? Level of schooling? Ambitions? Who’s her best friend? Does she have pets? All these things and more have opened up my mind and more brainstorming for my characters. Things I haven’t even thought about have come to the table and I have to think about my characters occupation, birthday, brothers and sisters – it has opened up to a whole arena! And I am going to try my best at writing. I talked about this openly in Wondrous Writing as well. I also had to write a short synopsis of my favourite book (The Governess of Highland Hall) using SIX emotionally powerful words. Does that GRAB you!!?? If you’re a sucker for historical romance like me, then I am sure that synopsis works for you! That was the FIRST thing I learnt and I am hoping this one little sentence gives me hope to just write on! Allowing yourself time is the best thing you can do. If you have mountains of chores to do, prioritise them, spend some time writing for 10-30 minutes or whatever you can do and then get back to those chores! And then when you have a time where you are bored and have nothing else to do. WRITE! I just finished packing the dishwasher, then I asked Mum what else I could do and she said no and I was happy to go back to my blogging!!!!! It gives me such excitement and a passion to do this and have never felt a fulfilled heart like this before. Honestly, you will feel so much achievement when you have finished publishing that article!!!!! Do some research for character names and maybe randomly Google names of places for your set location! Research the time period. For example, I am going to start reading THREE books I have listed in my Book Collection blog, Venetia, Cotillion and Sylvester written by Georgette Heyer because these book covers and stories and time period of the regency period appeal to me. And I hope I write something similar to that genre. I think I have said this before, but it’s what inspires you to write!!!! Having an open mind to new things and openness to learning opens up a whole new world!!!!! You will then get ideas for conflict and a storyline, and what to put in. I still have MUCH to learn! But I just wanted to share with you what I learnt today and I am excited to read, write and learn! So, I hope what you have read on this blog has inspired you to either write, read or type! I love my trusty laptop! And my fingers typing away like mad! I hope hope HOPE there’s a story in me……..
P.S Wendy was such a lovely lady so I bought her book for $10, all about when she went backpacking around South America. We talked a lot about blurb, and this grabbed me. Can you spot the “emotional” keywords? A member of the society, Anne Marie Price wrote a book called “The search for the King James Bible“. The title grabbed me as I am interested in biblical history and it sounds like a good story too! I downloaded it on Amazon for Kindle and it was only $3 to purchase! I am completely intrigued!!!!!! For those that know me, I am a Royal Albert addict. 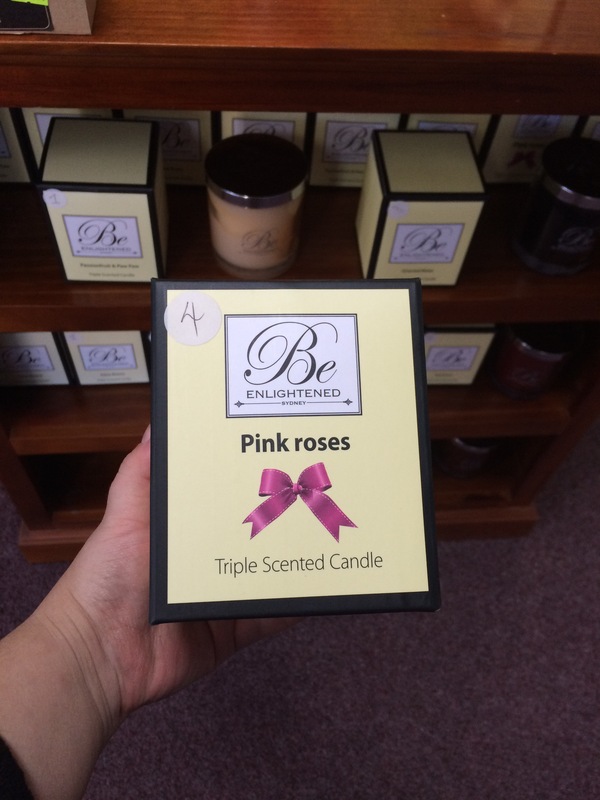 I own the set of “Old Country Roses” and it is my favourite collection. I collect teacups and saucers, and am a “high tea” lover!! If you go to my soup recipe, in Winter Warmer, there are a few recipes you can find on the Tea Time website. I am definitely trying the SCONES!!!! and want to take photos of while doing it, and will probably set up a little high tea, and share with you what I do. I am excited!!! But I need to start somewhere!!! I can’t bring out the china because it is all in storage in Melbourne, and I will probably be moving again some time soon! I am loving the Miranda Kerr Collection, it is pretty and feminine, and I adore the teapot! Just like the Royal Albert website says!! Tea tastes better when served from a fine bone china teapot. The teapot is ONLY $99.95. Go to Tea Fit for a Queen for a look at a trio of pretty tea sandwiches, and what recipes they are using for the celebration of the Queen. I absolutely love this article, and love the look of Coronation Chicken Sandwiches, and am going to try the recipe some time soon. I can’t wait to try the Royal Wedding Tea!!!! oooooo!!! It is found on the Capital Teas website. Here is a recipe for Coronation Chicken Sandwiches if you can’t get onto the Tea Time Website. In a large sauté pan, melt butter over medium heat. Add onion, and cook, stirring occasionally, until onion is tender and translucent, 5 to 7 minutes. Add chutney, tomato puree, water, vinegar, curry powder, lemon juice, salt, pepper, and bay leaf, stirring to combine. Bring to a simmer. Simmer, stirring occasionally, until sauce is thick (like ketchup), 8 to 10 minutes. Pour sauce into a large bowl, and let cool completely. Remove bay leaf from sauce, and discard. Add mayonnaise to cooled sauce, stirring to combine. Add chicken, almonds, apricots, green onion, parsley, and currants, stirring to blend. Spread a thick layer of chicken salad onto a bread slice. Top with another bread slice. Repeat with remaining chicken salad and bread slices. Using a serrated bread knife, trim crusts from sandwiches, creating squares. (Discard crusts.) Cut sandwiches diagonally into quarters, creating 4 triangles. Here is the Lady Carlisle set. It is a favourite and I absolutely love it. It reminds me of my Mum. I think it is her favourite. In our Melbourne house we had a dining room filled with china, and it was my favourite room of the house. It was very pretty, and I can’t wait for the day I settle in my own home, and decorate my own house with china and such! There is a Lady Carlisle tea set sale on the Royal Albert website. One of my favourite TV Shows is Antiques Roadshow, and I have a LOVE for old antiquities, and anything that is ancient. The history and the era…. I just love it. Well, the 19th century days. I love hearing about antiques on the show and learning all about them! 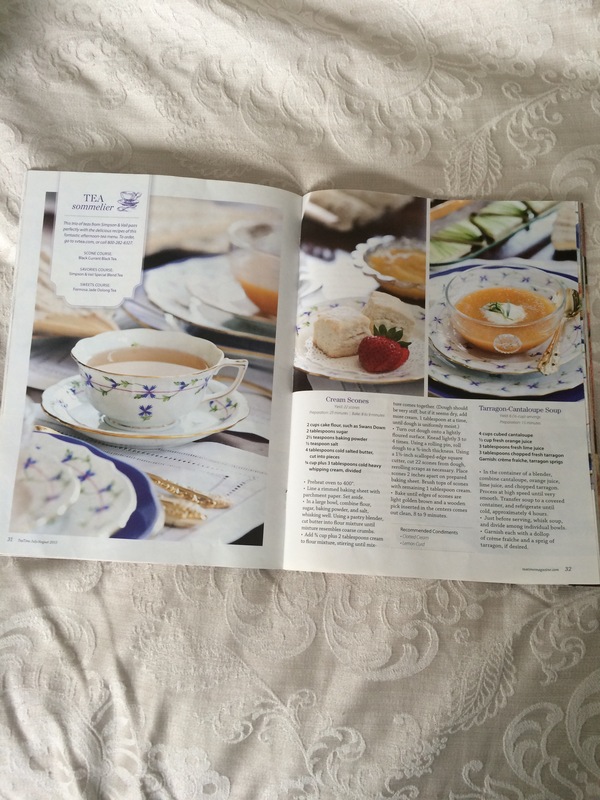 Anyways, it is nice to share a recipe, and my love for Royal Albert!!! Lucky I am NOT living in a major city because I would be found buying collection after collection in the department stores!!! What is your favourite Royal Albert set? Do you like collecting china or antiques? I decided to go back through my blogs and have a read of them. I have surprised myself!!!! Some things I look back at and I go WOW! Did I write that!!!!??? Or how did I come up with that? I have allowed inspiration to take with me everywhere I go! So I hope anything that I have written has inspired you about life. I believe I have done my job if I have at least inspired or reached out to one person in this life! I have surprised myself as a writer, and I am excited about this year. Like I said, I am in the middle of Library Studies, and I was very proud when I just finished an Assessment for Develop and Apply Knowledge of Information Services. I did a Cover letter, Selection Criteria and a Resume, for a position that the lecturer just gave us. It should take about another three months or so! I love the process of studying, and I am already thinking of what I will be doing after I finish it. I have PLANS!!!!! I did a bit of reading and was able to finish this subject easily. From reading and writing, I am inspired to try and write something similar of Enid Blyton! She was my favourite author growing up, and when I was little I used to listen to the audio books of The Folk of the Faraway Tree, or The Magic Faraway Tree. Places like Topsy Turvy Land take me to a whole other world!!!! And opens up my mind to a BIG imagination…. If I just used my forbid imagination, I hope I can come up with something!!!! I am half way through “The House on Quill Court” and the writing is just beautiful. As per my blog, Great Goodies. I love it, and I think you will like it too! I have totally forgotten what it is like to write an essay, but if I put my mind straight onto things I hope I can publish something. It is a BIG dream of mine! I had the dream of being an author when I was a teenager when I was in Year 10. I grew up without a TV in the house, so I spent a lot of my time reading, and I was a huge fan of The Baby Sitters Club or Sweet Valley High. I don’t read them anymore, but I wouldn’t be ashamed to still read them at the age of 29! We all grow up in our own good time and I am still learning to grow up! Haha! Three months until I am 30! Eeekkkk!!! It is a great journey, and I love my life. Although, I feel it would be better if I were living back in Melbourne, but maybe Merredin is just a passing through season. I feel it is to be a passing memory, as I know I won’t be here forever. My dream is London, as anywhere big like Melbourne would be heaven!!!! Harrods and Fortnum & Mason are DREAM DESTINATIONS!!!! Now if you are wondering what this blog is about, it is not necessarily about anything! I just write what is on my heart or on my mind, and then I decide on a title after I have finished. I feel like I could write forever but I won’t bore you as much. I basically wanted to write about “writing” as it is the body of the blog. There is so much to talk about when it comes to the broad topic of writing. People write for fun, work or a hobby, and my granny was a writer, so in my heart I wish to be like her. She only wrote two short books, but I would like to write a novel eventually, which she didn’t do based on one of the estates my ancestors lived in Cheshire. I have the idea of a novel, but will keep it a secret till I visit England and see firsthand what things are like there. I wrote two chapters so I was pretty chuffed with myself!!!! I have a love for old English places and writing, so we will see how I go with it! I love books that are similar to Downton Abbey, as the time period takes you to a whole other place! I can not WAIT till I go to England!!!! I feel like there is SOOOO much to learn, and I have a love for history of castles and palaces mostly, but Cheshire is on my heart as my great, great, great, great grandfather lived in Arley Hall. Check out Arley Hall and see what it is like!!! Like I said, I cannot WAIT to visit!!!!! For fun, you can also check out Tatton Park where my other ancestors lived. Doesn’t it look MAGICAL!!!!!!!!???? My heart is bursting to go! It is definitely on my heart. Is there something that you would like to write? Is there anything on your heart to write? whether its journalling or a novel? What are you inspired to write about!!!!??? Now that we are in the Season of Winter in June it is time to bring out winter recipes for the kitchen! 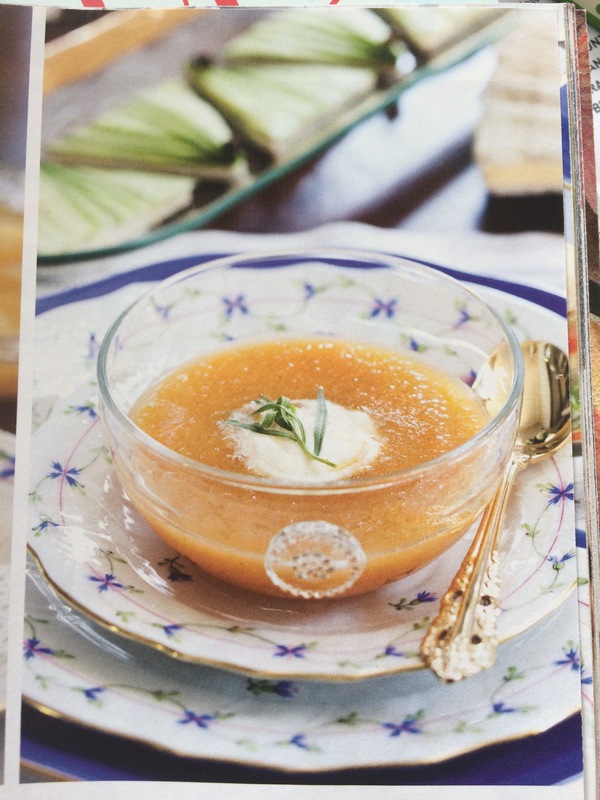 Here is an easy soup recipe that I got from the Tea Time Magazine of the July/August 2015, Volume 12, Issue 4. In the container of a blender, combine cantaloupe, orange juice, lime juice and chopped tarragon. Process at high speed until very smooth. Transfer soup to a covered container, and refrigerate until cold, approximately 4 hours. Just before serving, whisk soup and divide among individual bowls. Garnish each with a dollop of crime Fraiche and a sprig of tarragon, if desired. Next time I do a recipe I would love to actually make it and take photos while doing it. I got the idea from a friend and am super excited to do another recipe for the blog! Now I can CREATE a RECIPE category, so you can flip through, for when I post new ones!!! Eeeeee I’m so excited!!!!! Already can’t wait for whatever the next recipe shall be! 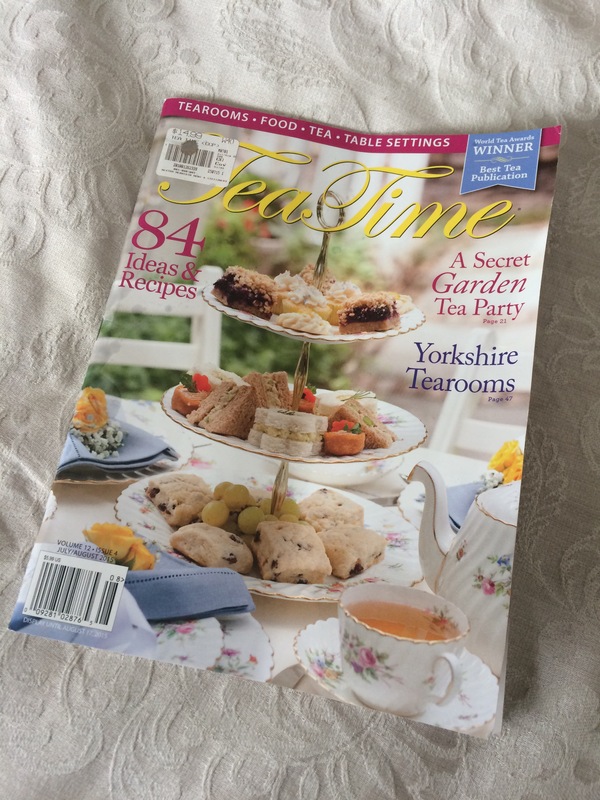 If you click on the highlighted area of Tea Time Magazine, it will take you to their website and you can learn how to make Peachy Blue Cheese Scones! 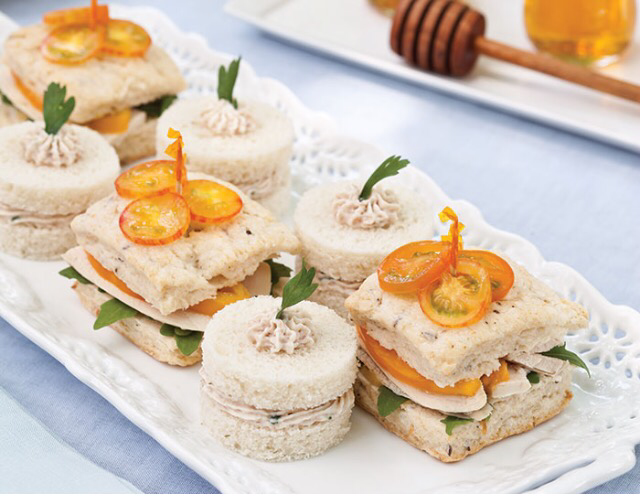 Or Ham Mousse Tea Sandwiches, perfect for any afternoon tea. Don’t forget to visit the Downton Abbey section! Where they tell you all about Lady Carnavon and the real people of Highclere Castle. I hope you enjoy the website, there is a lot to explore!!!! !